Running times: 15 minutes and 20 minutes (Default running time/15 minutes * Maximum running time/20 minutes) - Custom filling using customer supplied material is also available. 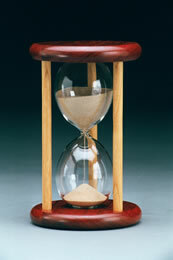 When an hourglass case is made of two different hardwoods the main or dominant color is shown in the swatch. The secondary color is that of the spindles and is shown in the bottom right hand corner of the swatch. * Note the additional cost for Padauk/Cherry and Koa/Maple.